Photos of the Week: Tadpoles in Autumn?? Who knew? Most of us assume that tadpoles are a wriggling sign of spring and summer. But wait – last weekend, tons of little creatures were wriggling just below the surface of a large wetland at Charles Ilsley Park. 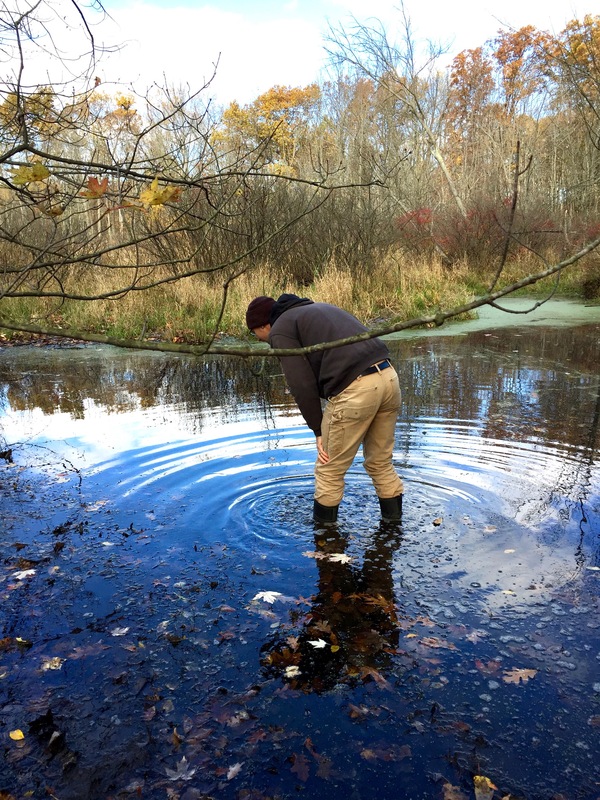 My husband guessed tadpoles, but I thought, “Naah, tadpoles hatch only in the spring or summer!” Next morning, Stewardship Manager Ben VanderWeide was kind enough to net some of the squirming critters from among the fallen leaves floating on the water. And despite the unlikely season, they turned out to be tadpoles, most likely Green Frog tadpoles due to their long, spotted, doubled-finned tails. It turns out that larger frogs – American Bullfrogs (Rana catesbeiana), Green Frogs (Rana clamitans) and Northern Leopard Frogs (Rana pipiens) – can take up to 2-3 years to reach adult size. So some of their young can still be in the tadpole stage when chilly nights grow long and leaves turn gold and crimson. These little tadpoles were preparing to slow their metabolism way down in order to hibernate underwater. Frogs, though, don’t hibernate like turtles, by digging down into the mud at the bottom of ponds. They’d suffocate if they did. Like adult frogs, tadpoles can breathe through their skin when completely submerged in oxygenated water. According to Scientific American, to keep water against their skin over the winter, they lie on top of the mud or only partially buried. Tadpoles have more surface area per volume than adult frogs do, so they can actually gather oxygen from the water more efficiently in the cold, motionless water. Ben scooped out a tadpole and I took a quick series of photos of it wriggling in a plastic specimen box. As a result, it’s possible to see a bit of how a tadpole moves itself forward by thrashing its double finned tail. So meet the tadpoles that taught me that autumn does not just mean long, cold nights, a cascade of brightly colored leaves and gray skies. It can also mean, of all things, tadpoles! I have collected adult green frogs as well as tadpoles in my fish traps (for purposes of finding out what’s down there) in January and I live in Minnesota! The frogs were slow moving but definitely not hibernating. That must be interesting to see! I think it’s so cool that they can breathe through their skin even in the winter. Thanks! It sure intrigued me. Thanks for the kind words, Bill. I was just so amazed to see tadpoles at this time of year! I learn something new at our parks all the time.